I will be in the Portland Open Studios in October 2019. 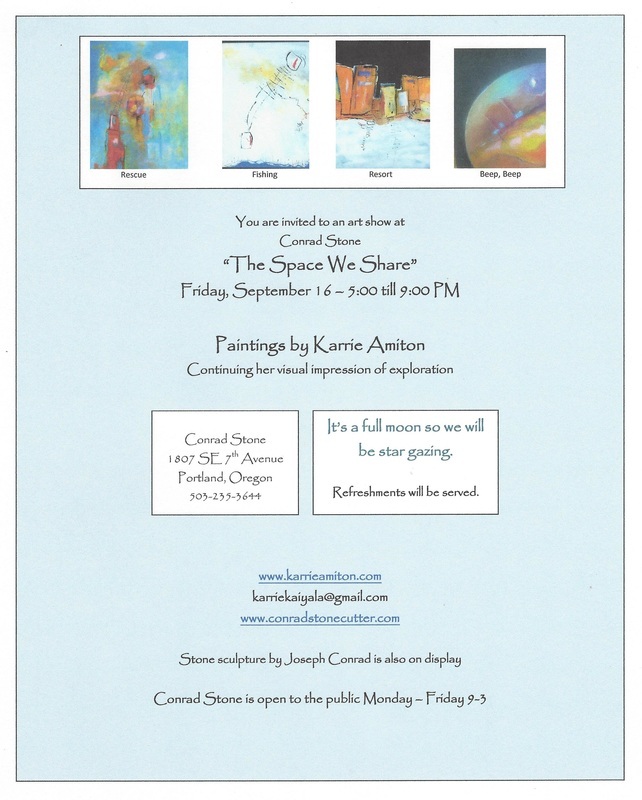 I am excited about using Conrad Stone Gallery space located at 1807 SE 7th, Portland, Oregon. I will be showing work and also demonstrating acrylic reverse painting on glass. 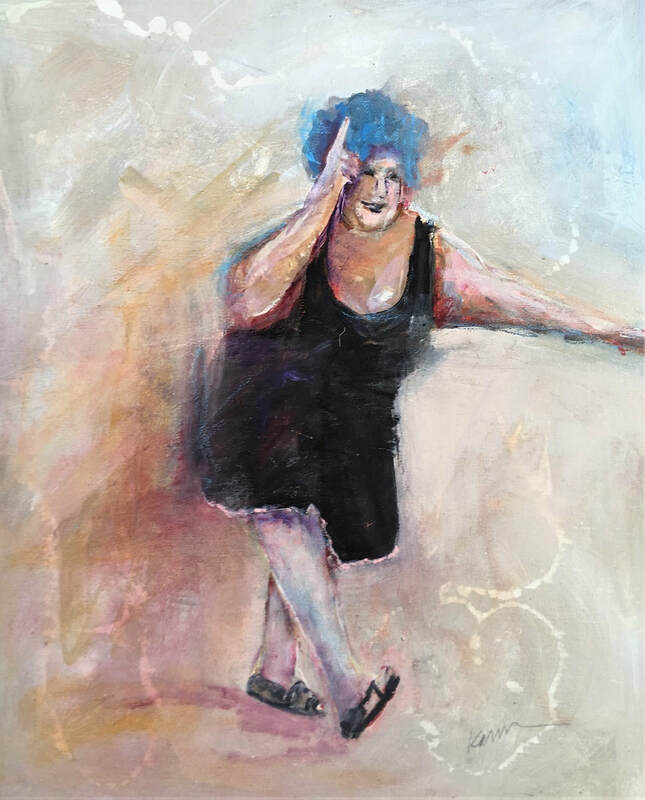 "​Wild Women" juried show going on right now at the River Gallery in Independence, Oregon. No matter the season, or what you are doing, someone is saying "it's 5:00 somewhere". These are a few of the images I've reversed painted on 1/4" beveled glass. The thicker glass adds a different dimension to the work - it has more depth and the glass itself gives a blue-green tint that at first I did not like. But, I am getting used to it and in some ways, I like it better. 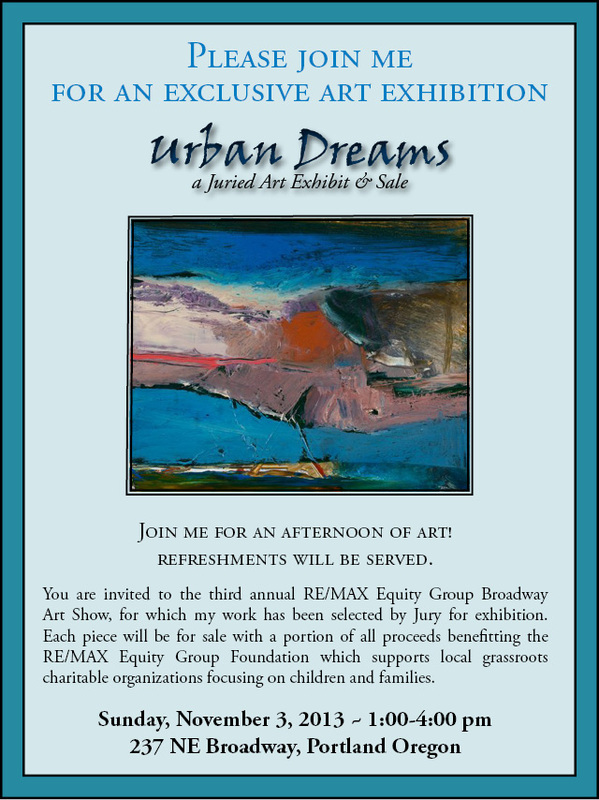 I will have four paintings in the Annual Re/Max Equity Group Art Show beginning October 6th 2018. A percentage of the sales benefit Rose Haven, serving 3,300 women and children to regain stability in their lives. The title of the show is "Acceptance". My intention is to abstract my thoughts by painting and repeating "One city, many voices". With this in mind I was inspired to communicate through the use of shape and color. Sticks from my yard dipped in Sumi ink were used to scratch ladders over the paint - symbolizing our welcomed cultural connections. ​Gallery 114 June Show, "Everything we do is Music"
Opening reception: Thursday, June 7, 2018 6-9 p.m. 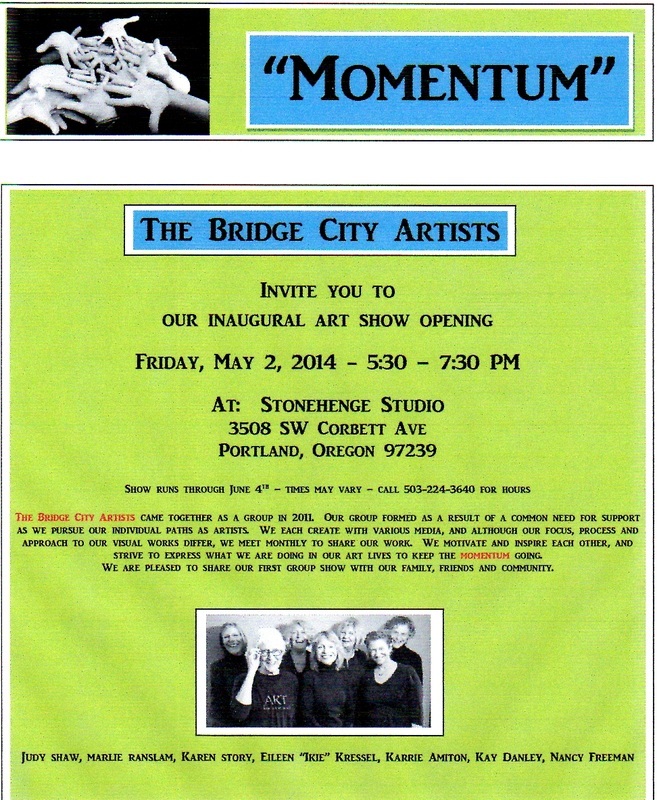 I will be showing my work at the Sidestreet Arts Gallery beginning Friday, May 4th. Check it out: www.sidestreetarts.com. So, what have I been doing for the last six months? The Bridge City Artists are awesome! I was busy doing all sorts of things but didn't get too much painting done. So, at the last Bridge City Artists meeting I decided to set some goals for 2018. I intend to be very busy painting and experimenting. . . as well as making pies and traveling. ​I will open a show at Antolin Cellars on Friday, June 2nd called "Kick Up Your Heels". ​If you can't make it the show runs for six weeks. ​The tasting room is located in the old train station at 14 North Front and will feature live music, wine tasting (of course), artwork, friends and family. The event is free, the weather is great so please stop in and enjoy the fun. ​It's time to kick up your heels. Beginning June 2nd, 2017 I will have two paintings hanging at the new Yakima Steak Company located in downtown Yakima, Washington. Stop in and check it out and have a great meal while you're there. ​Everyone is invited to this event. I continue to paint my impressions of other worlds, inspired by the mission of astronauts Mark and Scott Kelly. The show is at Conrad Stone, a fabrication shop that also has a gallery showing Joe Conrad's stone sculpture and now my 2D work. I was the estimator there for some years and delighted to have been invited. ​We will be star gazing (if I can master the professional telescope so graciously loaned - And, if it doesn't rain!). 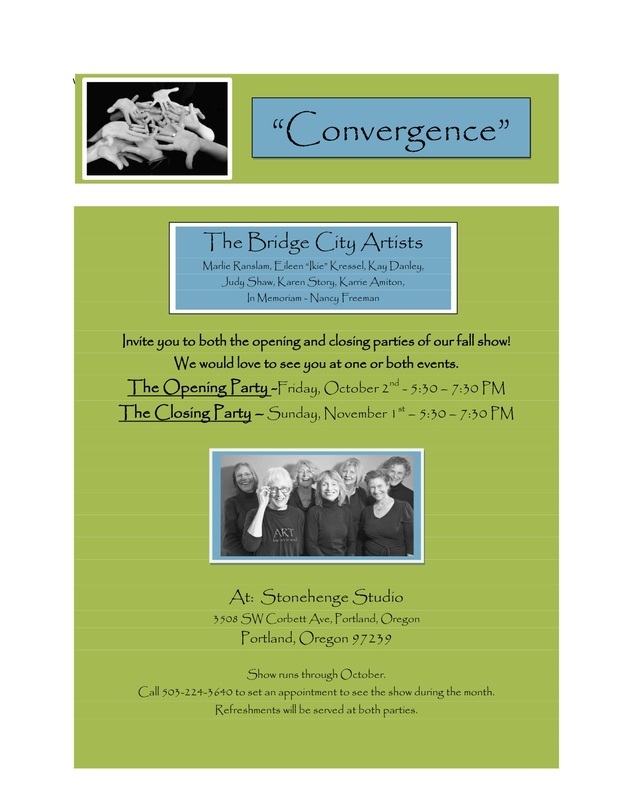 I am happy to announce that the art group I am in, The Bridge City Artists, will show work at Cassidy's Restaurant for three months beginning January 9, 2016.
www.cassidy'srestaurant.com. Please stop by any time, have a drink and dinner and let me know what you think of the show! I've been quiet for a month or two because I moved locations! And, I've also been busy painting a very special commission piece that won't be revealed until later this month. Check out www.artisticportland.com. to find information about my new home located in downtown Portland at 318 SW Taylor. This new gallery features 50 local artists and looks like it will be a great shopping destination. There are items in every price range from jewelry and greeting cards to fine art paintings. It's been fun to mix it up a little and relocate to this fine downtown hot spot. 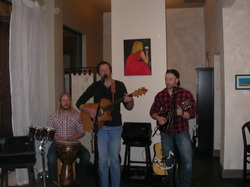 Stop in to hear the wonderful "Common Deer" at next weeks Spring Barrel tasting. what's been coming out of those French barrels. until I've had my coffee and . . . more coffee. artwork on April 24th so stop by and say hello. By the way, Tony now has a great tasting Rose. Summer. . . .
Antolin Cellers in Yakima, Washington. www.antolincellars.com. for their special events. tasting room, cousin Bev who volunteers to pour, bottle and be the best friend to everyone. If you can, try to catch First Friday when those cuties from Seila, Washington, "Common Deer"
This great spot makes me very happy. I'm so happy to be part of the Re/Max Art Show again this year. All four of my pieces were juried in! reverse painting on glass and include "Path to the Beach", "Don't Fence Me In", "The Alvord Desert" and "She Likes Red". Wow, S. (Shirls) Asuten Libed and I are having a joint show at Six Days Gallery the month of August. The opening is on Last Thursday, July 31st from 6:00-9:00. Shirls uses steel to weld some fine artwork for garden and home. I will be showing reverse paintings with, of course, the use of the color red. Please come join us for appetizers and libation. Antolin Cellars Tasting Room opening a great success. The show theme, "She Likes Red", was a blast. Even the band wore red! I'm pleased to announce that I will be showing my artwork full time in the new tasting room location. More details to follow. Here we are. 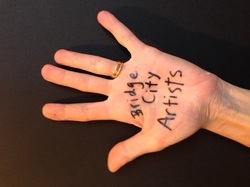 The Bridge City Artists. Please join us this Friday evening at the Stonehinge Studio for our first group show. The details are below - it's the "Momentum" show and we're pretty excited. Did I say FREE WINE!? "Birds" - see at Starbucks on NE Broadway and Grand in Portland. Also at Starbucks this month. Juried Show. 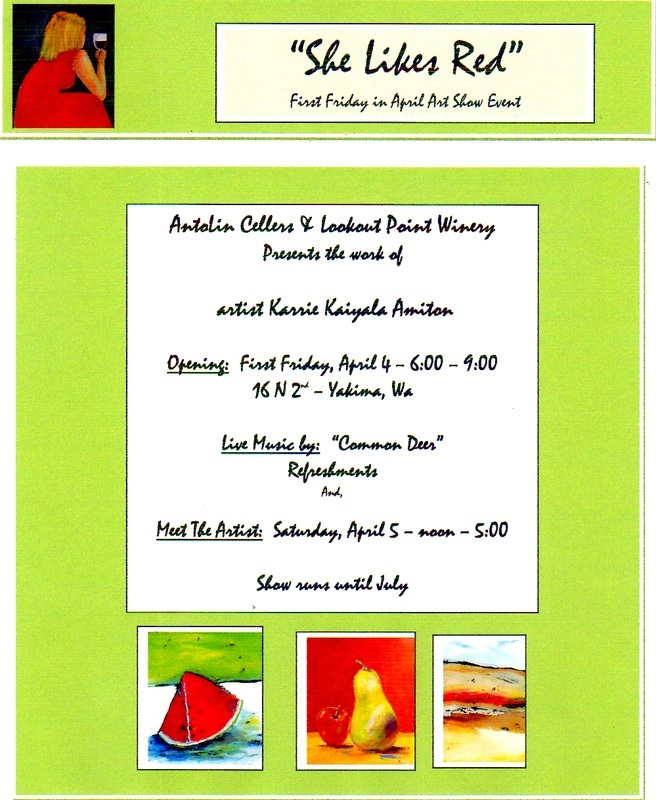 The opening is April 23, 2013 from 5:30-7:00 with music, appetizers and artwork to see and buy. This is a free event and open to the public in April and May. "Ocean" - acrylic on canvas Prints are available at the gallery. "Triplets" - acrylic on canvas I still love my "Carrots from another Planet" series. Most have sold but my big piece is still available. It is so hard to take photographs of the reverse paintings because they are painted directly on the back side of the glass. You can see many reverse paintings at Six Days Art Gallery at 2724 NE Alberta Street Portland, Oregon. Most of these pieces are landscapes. I don't paint from photographs but from memories of the colors and textures of the east side of the Cascades. July will be a huge month. I have three events; The Gresham Art Walk, The Estacada Summer Festival and a solo show at Cafe Eleven in Portland, Oregon. I am working on several reverse paintings for the Cafe Eleven show and trying to keep up at Six Days Gallery on Alberta Street. I am also exploring the Gorge again because I haven't shown in Hood River or White Salmon for well over 20 years. How time flies! If you see me in July please stop and say hello. I am in a 6"x6" show at the Village Gallery of Arts for the month of May. The "Art Challenge" gave over 80 artists only one month to paint a series of four paintings each and will be displayed throughout the month. Please see www.thevillageartgallery.com for more details. Last Thursday in January, 2012 - Tea Tasting featuring Townsend Teas from 6:00 - 8:00 in the gallery. It's "National Tea Month" and Gallery Artists will provide heart shaped cookies to all of our guests. Come in, taste some wonderful teas and enjoy the new artwork. When you are on Alberta Street please stop in the Six Days Art Gallery. 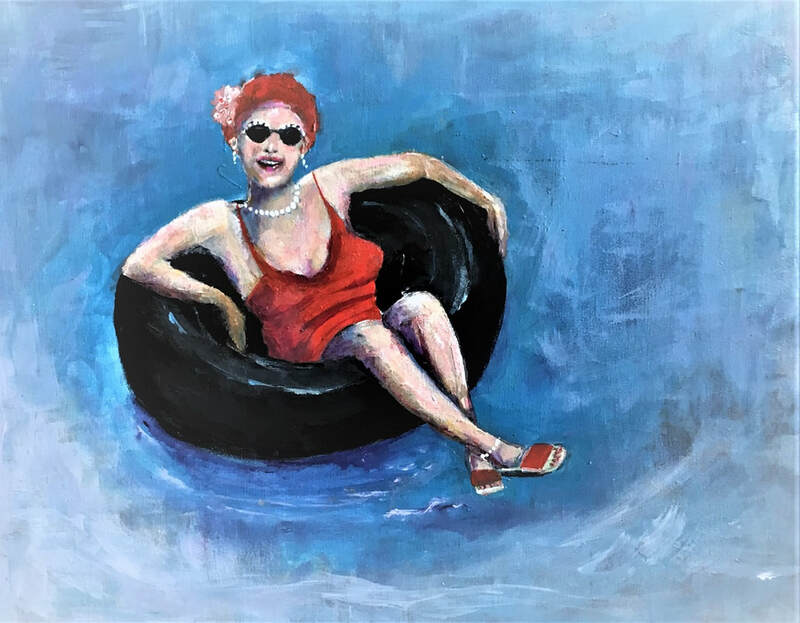 Our up-comming event "A Story Goes With It" is scheduled for Sunday, October 23, from 3:00-5:00 and features the storytelling of our own Joy Corcoran. Each artist has also written a story about a piece of their art and many of us plan to be in attendance during this event. Wonderful event for your entire family! I will be hanging four pieces that will be included in a group show at Gresham City Hall beginning Friday, October 18, 2011 and ending December 1, 2011. The show was originally called "Fantasy Food Fest" but has been changed to "Group Show". And, since I painted for the food theme, you will see mouth watering, food-inspired paintings. Please visit the website for address & times. Open to the public - And, please support the arts!